I arrive into Amsterdam on a KLM connection and as such do not experience check-in. I learn from the flight screens that my gate for the flight to Quito is E3, a short walk from concourse D. Schiphol Airport is busy for this early morning arrival, and it does take some time to work through the crowds to the waiting area. There is KLM staff around the transfer areas, but the assistance is not as proactive or dynamic for flight updates as some other airlines. The seating area for gate E3 is small, and there is already a long queue when I arrive. Boarding begins on-time with a call for families with small children, followed by SkyPriority and Business Class customers. Economy Class boarding is called for the whole cabin, and as such, there are long-queues to be processed. Given this is a full-capacity flight, it is felt that a zonal format may achieve more efficiency here as queues are long in the airbridge. Boeing 777-200ER in Economy Class is at full capacity, and no spare seats are observed in the main cabin. I chose seat 43K during online check-in which is a window seat in the penultimate row before the washrooms and galley area. 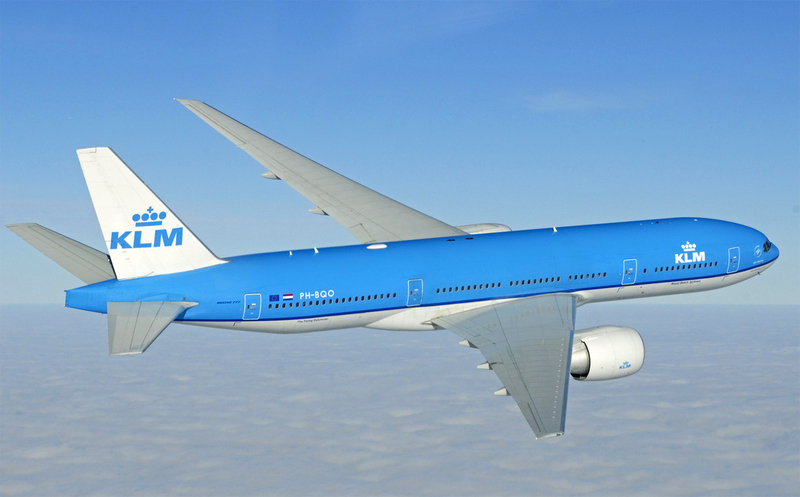 Like many airlines, KLM has configured this B777 in the higher-density 10-across layout (3x4x3). The seats are a newer slimline style with modified seat backs which means the leg space is quite good. However, on this full flight, the smaller seat width is noticeable, and comfort is somewhat weak. I am of average build, and I have plenty of room at the base between the armrests, but the space at the elbows and shoulders is inadequate. I have travelled long-haul on other airline with this type of seat, and primarily one’s enjoyment of the flight will come down to load factor and if you have a free seat next to you. As an example, I struggle to eat the meal and I must pick-up the individual dishes to find enough space. 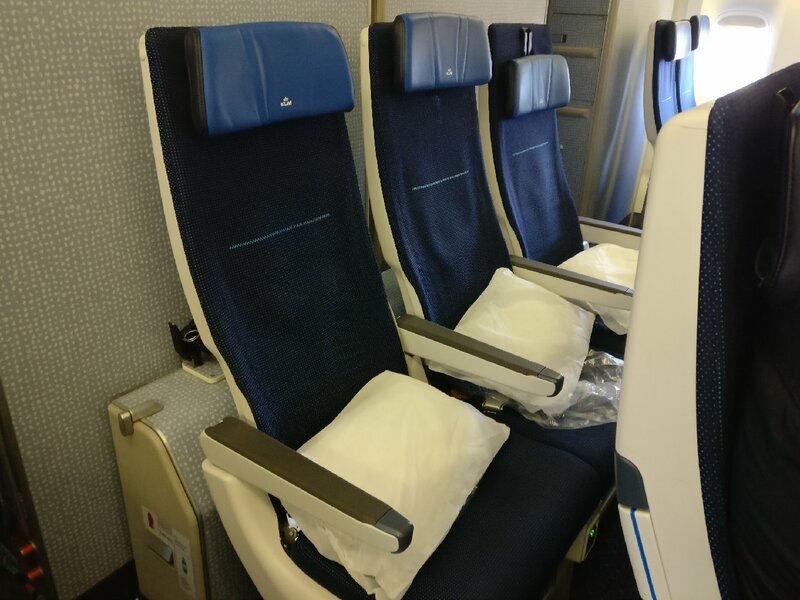 Once the forward seat is reclined (about 10-minutes after departure) there is little room to do anything much and staff do not ask customers to make seats upright for the meal services. 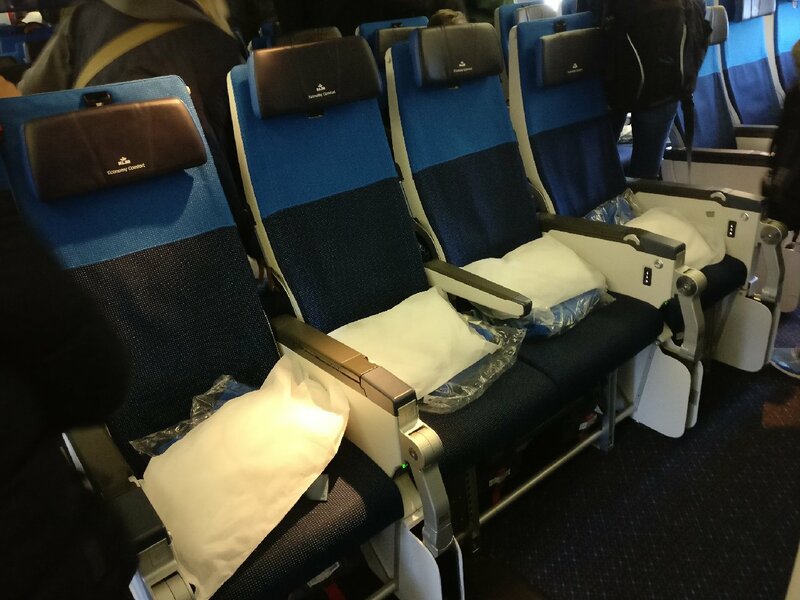 It is important to note that KLM offers Economy Comfort seats with extra legroom, and standard extra legroom seats but these are all still subject to same 10-across configuration. Aside from these circumstantial (but essential) complaints, KLM should be commended for the other factors of seat hardware such as seat power (USB and 110v) and widescreen PTV which are all very satisfactory. The cabin is quite clean on boarding, but some factors could be better if taking a more critical viewpoint. Core contact points for the carpets, seats and tray table are adequate, as is the seat pocket. Window blind trims are quite dusty and contain hair, and the gap between the cabin panel and carpet is also quite littered with debris. Cabin panels have a subtle grey motif but are rather scratched and marked in places. There are 6 washrooms for Economy Class and Economy Comfort, and these are well presented, they have the old manual style taps and suchlike, but the finish is quite modern. The flight departs 35-minutes late from Amsterdam and arrives into Quito 18-minutes behind schedule after a 12-hour journey. Service begins approximately 35-minutes after departure with a full bar service and cocktail snack. There is a choice of beer (Heineken), red and white wine, soft drinks, water and juices. Soft drinks are decanted, but full cans of beer and small bottles of wine are provided. Litter is efficiently cleared, and the meal service follows around 25-minutes later. Another full bar service is offered at this point. 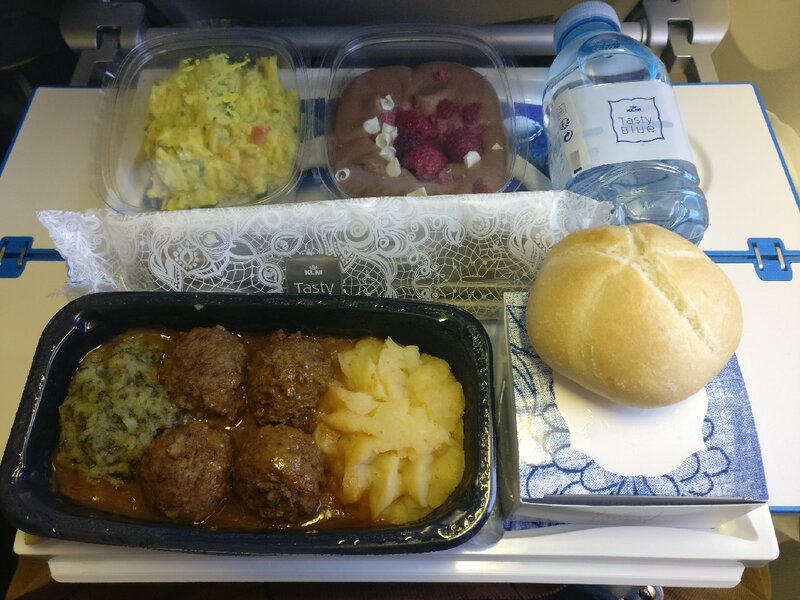 Meal tray presentation is quite elegant for Economy Class with the white tray styled with curved decorative Delft style edging. The tray cover also carries some pleasant brand elements, and this also features on the cutlery pack and condiments box. Cutlery is a very robust plastic and is excellent. The meal choices today are a vegetarian pasta (untested) and beef meatballs with mashed potato. There is a coronation style coleslaw for the appetiser and a chocolate and raspberry mousse. Warmed white bread rolls are provided, as are cheese and crackers. The primary food quality across the meal tray is entirely delicious and cannot be faulted in any way. For the bread, an inferior quality margarine style product is served, and staff also require passengers to take bread by hand from the basket which may be a concern for some customers. There are a couple of digestif choices available with the tea and coffee service, but it appears that other mainstream spirits are not provided. Mid-flight there is some proactivity from the cabin staff to serve a choice drinks from a tray (typically water, apple and orange juice). Additionally, there is a bar area set up in the galley with a selection of soft drinks, as well as cereal bars, crackers, mini chocolate and mints. Approximately halfway to Quito, the cabin staff offer a choice of ice cream or potato chips with cup water. 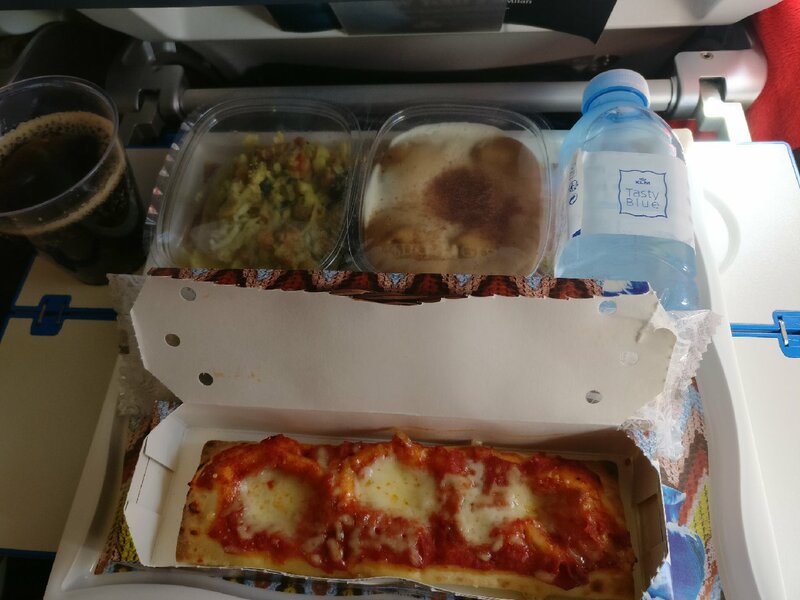 The pre-arrival meal is a slice of cheese and tomato pizza, Italian style pesto salad and a tiramisu style dessert. Again, the quality is all quite decent across the tray. For this late afternoon arrival staff provide the full selection of bar products and another service of tea and coffee. Every Economy Class seat on this B772 is equipped with full AVOD entertainment that is displayed on a 10-inch widescreen PTV. Gate-to-gate IFE is available – however, headsets are not given out by staff until after departure. The headset is similar to other transatlantic airlines, but you are likely to find even a cheap store-bought product gives better sound quality. The system user-interface is modern and well-branded and provides simple tabulated navigation around the choices. Visual entertainment categories are well-organised into Latest Movies (which includes some recent Oscar-nominated choices), The Collection – which is the older classics, Dutch films, World Cinema and Family. Overall, there are approximately 200 choices across the different categories in 15 languages/subtitles. In TV there are some boxset choices in comedy and drama, and this appears to contain 6 to 12 episodes at most for these options. There are also some respectable factual programming options and travel guides. CD albums have an extensive offer, covering a range of modern and classic choices. KLM does not provide any hard copy newspapers in Economy Class, but all customers can download and access its media app which has a 30 global newspaper options but you must do this before departure. The usual pillows and blankets are available each seat during boarding. The blanket is presented in the classic KLM blue colour. This is a thinner fleece-style material but provides adequate warmth. The pillow is white and has the more typical synthetic style disposable cover. In the washrooms, there is a hand soap only. KLM does not provide any comfort kit (eye mask, earplugs and suchlike). Hot towels are presented before the final meal service. Staff service is a little-mixed overall, and some of the crew are on the stern side. Efficiency is excellent, and staff are quite present outside of the main service times. The service is not really enhanced in any way, meal drinks are all offered with quite basic descriptions and minimal dialogue, and staff are not that chatty in the galleys but do seem quite happy for customers to congregate and stretch their legs in these spaces. Staff presence for arrivals is very acceptable, and as the aircraft continues to the city of Guayaquil, there is excellent assistance for transfer customers. 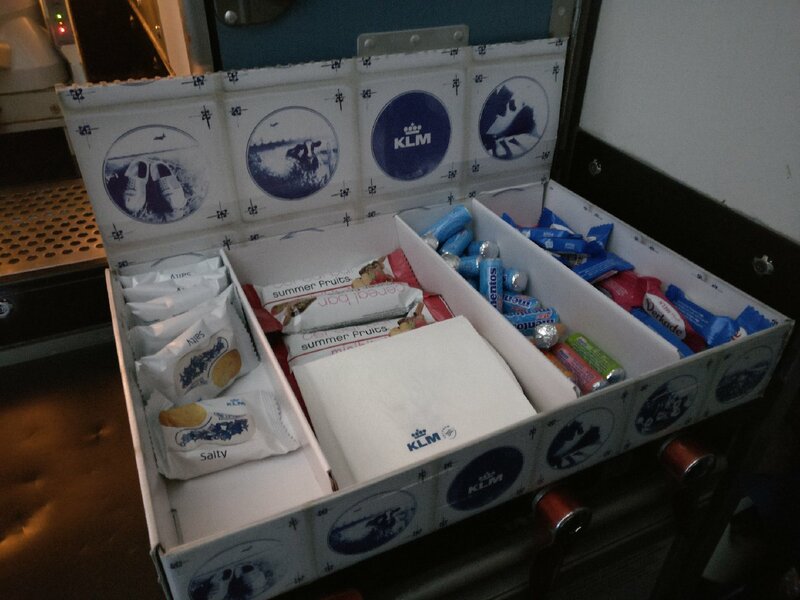 There is a lot to like about the KLM Economy Class experience and the catering and IFE stand out as being particularly strong. There are aspects of the seat which are decent, such as adapted seat backs for extra leg space, in-seat power and IFE screen. Having said this, I was not particularly comfortable during any stage of this long flight. I was travelling alone, so perhaps if you are flying as a family or a better acquainted with your neighbours the tighter space may not be such an issue. 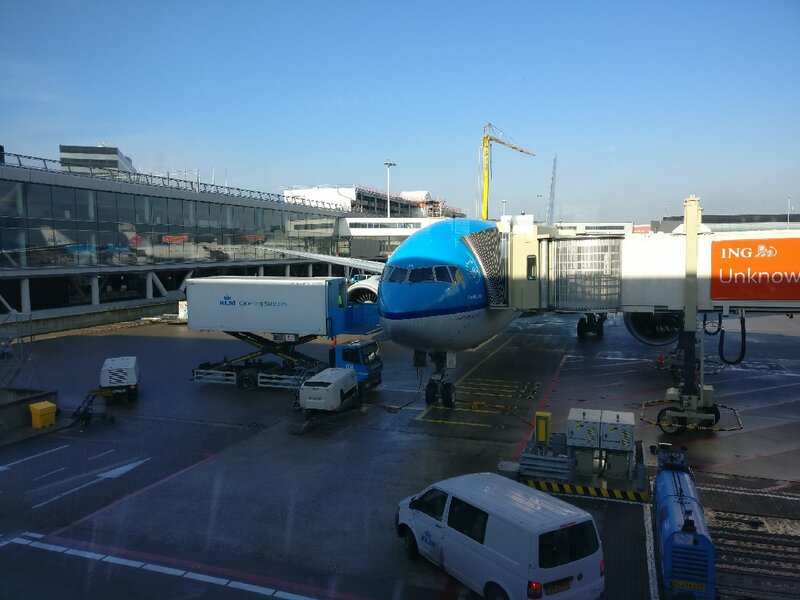 Staff can be described as business-friendly, they conduct the service with efficiency and purpose but do not stand out as being that chatty or interested in customers – it is a shame, as this is unlike other KLM long-haul flights I have experienced. Staff do seem to know a few words of Spanish for local customers, and there are Spanish PA announcements, but the quality is somewhat rudimentary, but they are understood.